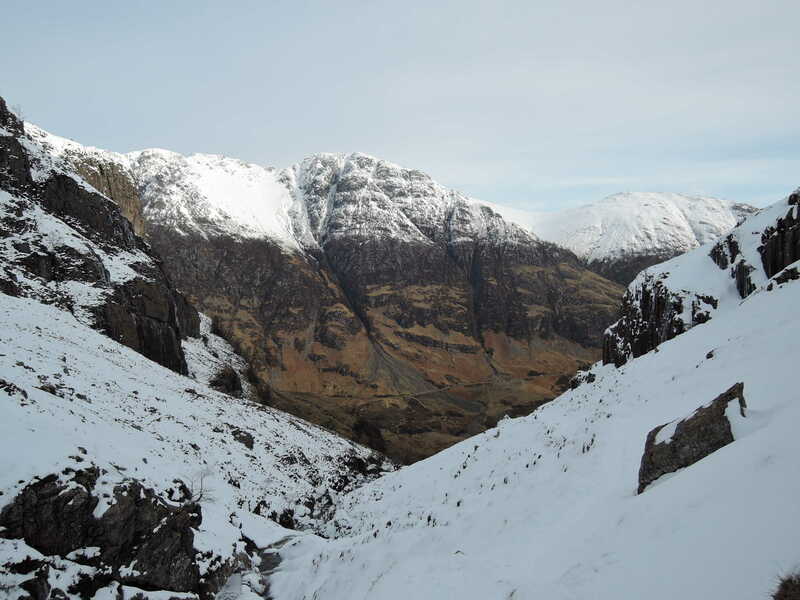 I have learned that there should not be a winter without a trip to Glen coe. Well to Scotland but for now I didn’t feel the need to go further. And this time was no exception. Same like the previous year, as soon as February arrived, I packed my bags, booked my flight to Glasgow, bus to Glen coe and there I was. Almost felt like a routine. Only this time I was going to discover that mountaineering has more to offer than only snow. Mixed climb, sharp and exposed rock ridges, adrenaline and greater rewards. I’ve met again with Jon Gupta, the man who taught me so much about mountaineering and will probably do so until I will be confident enough to reach for my goals. It did hurt me a bit when I found him listening to Justin Biber ( or whatever his name is), but he always answers my endless flow of questions so will just call it even. Simon, from the previous year, was already there. After a warm up session on Buachaile Etive Mor was time for some action. My first grade II, which apart from one steep section I must confess was quite easy and straight forward – School House Ridge. Nevertheless fun short scramble. 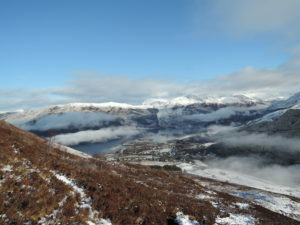 The route starts from Ballachulish village, follows the road uphill and makes a right straight into the mountain short time after. We zig zag-ed through the mist gaining altitude until we finally got above the clouds. 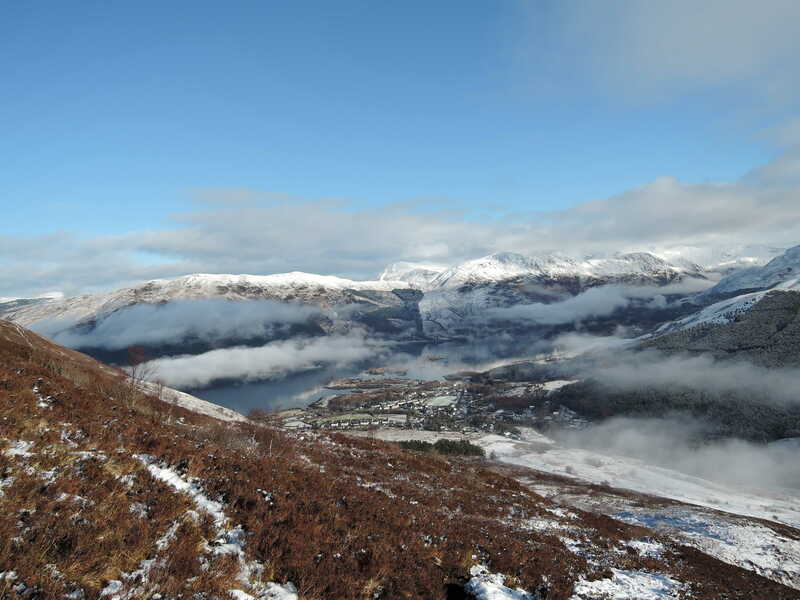 A fine view of Loch Leven and villages below. The ridge itself is more of a grade I with a few exposed sections but in good condition and plenty of holds to grab. 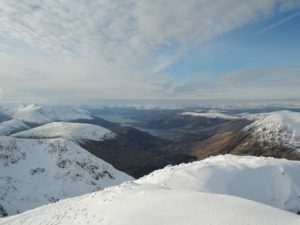 Once got to the top, it drops in a little col and a long ridge takes you to one of the munro’s summit – Sgorr Dhearg (Beinn a’Bheithir). 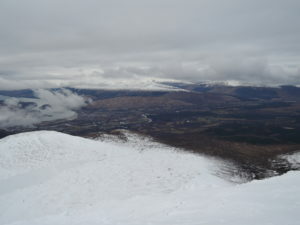 Next day we jumped in the car and head to Ben Nevis. I was quite excited to see what’s all the fuss about. We left the car in the parking lot and took the unpaved trail through the forest. Gaining altitude slowly over almost 5 miles until it reaches Charles Inglis Memorial Hut. Revealing the big North face of Ben Nevis. I had to stop and take it all in. Quite impressive and nothing as I was expecting. Having climbed peaks over 4000m in the Alps, my image of Ben was of a “hill” just a bit over 1000m. And boy I was wrong. There are so many routes, it’s quite overwhelming. Everything for everybody from easy slopes to difficult cracks, mixed climbs and ice. And after climbing one of them I can certainly say it was a totally different experience from the Alps. Not better, but different and in a good way. That kind of different that makes you want to come back for more. That makes you watch Ueli Steck climbing “The Secret” over and over again. Unfortunately Simon had a few blisters and decided to turn back. And while Tower Ridge seemed so tempting and an amazing route, we stuck to our initial plan and went ahead to the start of Ledge Route. It was a fine climb and I quite enjoyed it. The 450m ascent ended more quickly then I would have wanted though. It did however seem more of a easy II and looking back I wished we have done something more challenging. Apart from one tricky section it did not pose much difficulty for someone that hasn’t done any technical routes before. Maybe just because was mostly snow rather than rock. But in the end it was a good introduction to Ben and the weather was perfect. 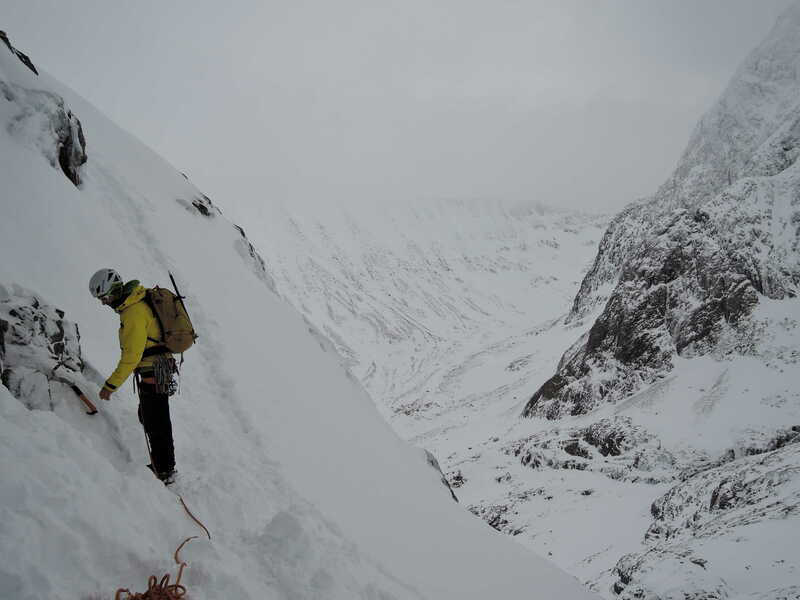 Snowed all the way until the last pitch just before the summit, for a proper feel of a Scottish winter. Then clouds dispersed just to reveal a wonderful frozen scenery. Now I understand why people love to climb in Scotland. Is not about the altitude, is about the routes and what they have to offer to you as a climber. We crossed the Carn Dearg summit plateau and descended towards the valley. At start is quite steep and care is needed, especially on the rocky section. Once you start loosing the altitude it becomes harder. Long grass covered with wet snow that gets stuck onto your crampons making them bulky and heavy. Try taking them off and you’ll slide all the way to the bottom. But when the snow ends the landscape changes into a boggy area. One have to jump in order to avoid getting stuck in the mud. And it wouldn’t have been a good story without having my foot, shoulder deep, into one when a small bridge collapsed. Luckily my boot gaiter kept the mud out and it was only a bit wet inside. At last the route crosses the stream to join the initial ascent trail, and shortly we were back in the parking lot where Simon was waiting for us. 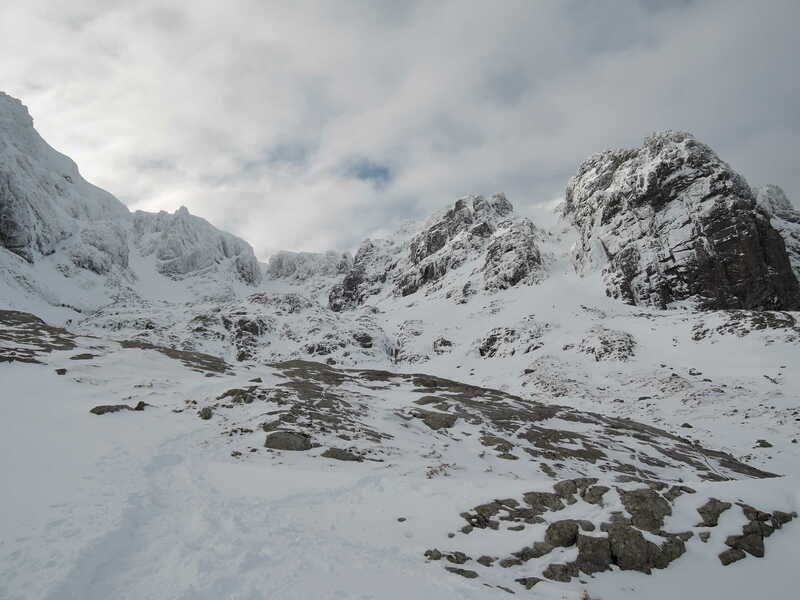 A great first experience on Ben Nevis and surely next time I will choose an abseil rather then descent the same muddy route. Sadly the days passed by pretty fast. The weather however seemed to be our friend and gave us one more chance for a last climb of the season. Close to Glen coe, but deep into the mountain, Dorsal Arete was a top choice. It has everything I’d want in a route: close to road/parking, relatively medium length approach, steep slope at the start, exposed ridge and a chimney leading up to the summit. Add this to perfect weather and you got yourself a great climb. It’s a grade II and it does feel like it. You can spice things up a bit and start with a III or IV from lower buttress. 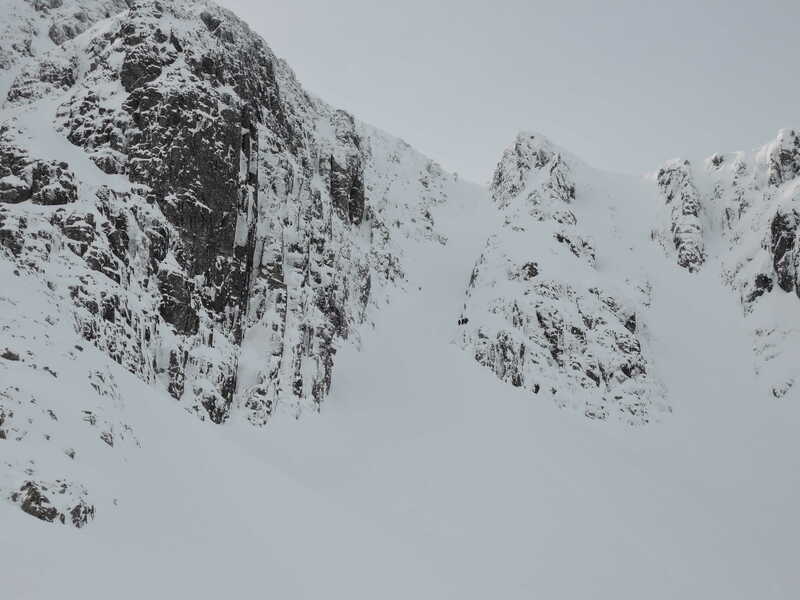 The route starts from the parking lot on A82, 7km out of Glencoe, descents into the valley, crosses a bridge over Coe river and then climbs south following the left bank of the stream running down from Coire nan Lochan. At about 700m it turns right into a snow filled gully to get to the base of the climb. Dorsal Arete is the ridge right to Broad Gully. 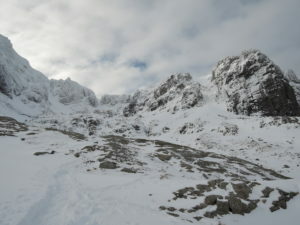 The climb starts steeply on a snow slope and progresses into relatively easy rock climb. There are several natural belay points to throw a sling but a few nuts and slings will come in handy. A puffy warm jacket comes in handy as you won’t be seeing the sun until the top and it does get cold. And by puffy I meant 100g+ of primaloft not down. 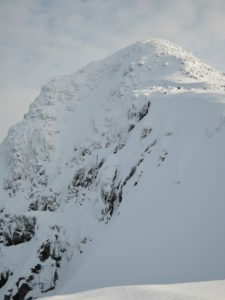 Once of a sudden you get pass a pinnacle and on a knife ridge that goes into a chimney and tops into the summit ridge. 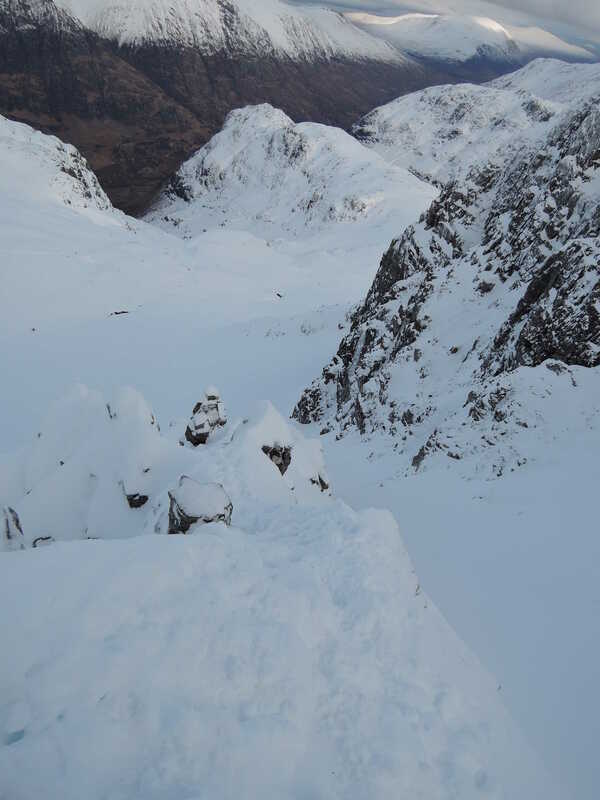 You can go left of the ridge and make an exposed traverse above the Broad Gully. 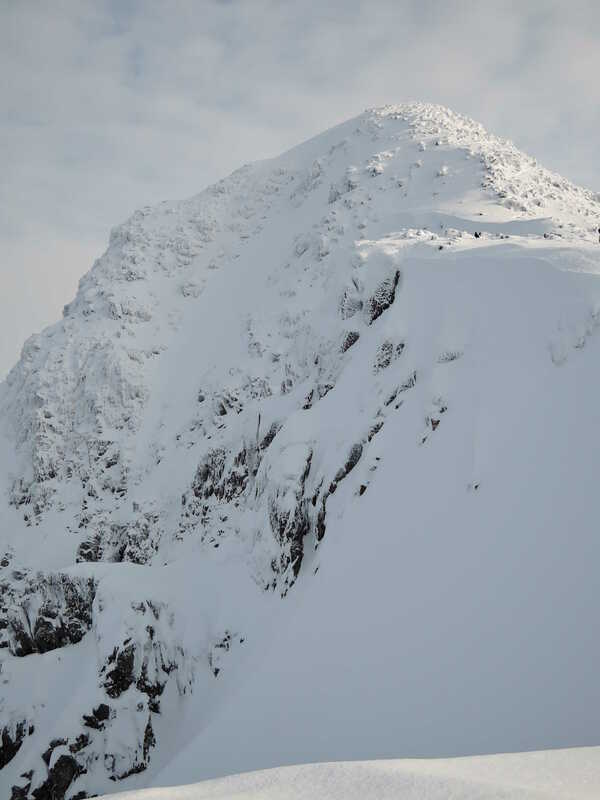 A short ascent will take you to the summit of Stob Coire nan Lochan. We descended by NW ridge and joined the initial route back to the car. An exciting 1 day climb that I hope to solo in the near future. It’s strange how goals and aspirations change in such a short time. Everything started about a year ago when the desire to climb Matterhorn overwrote my plans for high altitude climbs in The Himalayas. And even though I was not a fan of mixed climbs I now started to quite enjoy it. And even without wanting or even realizing I start craving of routes like Tower Ridge or West Ridge on Eiger. You can find some additional photos in the gallery section and the entire trip video below.